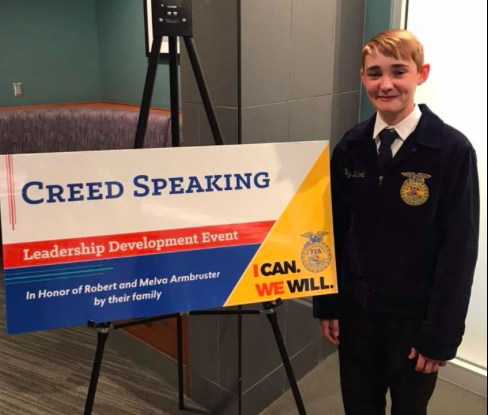 After winning the Kansas FFA Creed Speaking competition in May, Uniontown FFA Member Clay Brillhart was set to represent the state of Kansas at the National FFA Creed Speaking Contest in Indianapolis, Indiana. On October 25th, Brillhart competed against 46 other contests from across the United States. In the preliminary round, Brillhart competed against six other speakers with hopes of being one of the two to advance to the semi-final round. After presenting the Creed and answering questions related to the Creed and agriculture, Brillhart was selected to advance. The semi-final round featured the top 16 Creed Speakers from across the country. From the top 16, four speakers advanced to the final round. Brillhart did not advanced, but was recognized that evening at the awards banquet for finishing in the top 16 speakers in the nation and earning a Silver Emblem. Clay Brillhart is the son of Mark and Diane Brillhart of Hiattville. His FFA Advisor is Scott Sutton.